Christ very clearly calls us to love one another. He also tells us to love our neighbor as our self. That implies that He truly expects us to love ourselves as the foundation for other loving relationships. But does loving others mean that we should allow them to take advantage of us, hurt us and walk all over us like door mats? Absolutely not! 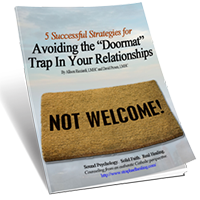 Falling into this “door mat trap” just leaves us feeling exhausted, resentful and miserable. Who wants that? !